All of the gardening lately has helped to remind me how much I really love orchids. 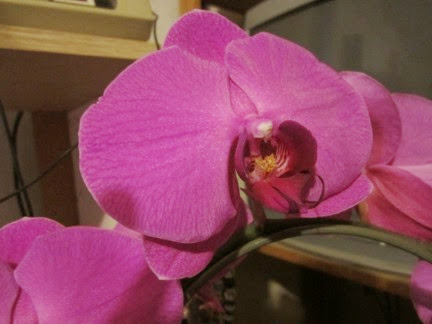 Yesterday at Trader Joe's I saw a beautiful purple phalaenopsis and it followed me home. 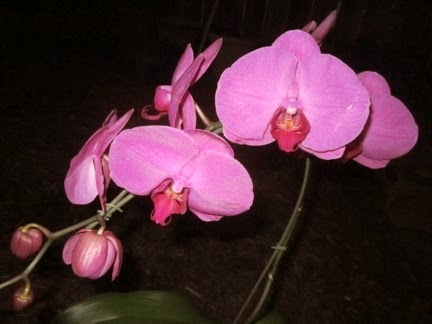 Once an orchid decides to follow you home there is little choice but to surrender! The new orchid is the same kind as Sally but unlike Sally it is really large. All of Sally's flowers fit in one hand but the flowers of the new orchid are so large that each flower is as big as my hand. This lovely orchid was only $12.99 and was grown in Salinas CA. I plan on studying the two new additions to the shade garden. It will make a lovely embroidered square for the needle painted quilt. It will be a challenge making up a pattern. I hope to get started after the wild pansy is done. But before either of these projects I need to write an article for the Bishop's Peek EGA newsletter. Lot of stuff to keep me busy!